Do not store above 25°C., Keep bottle in the outer carton. For the relief of fever after vaccination at 2, 3 and 4 months - See the leaflet in the box. For the relief of pain and other causes of fever - refer to dosing tables. Always use the syringe supplied with the pack. Do not give more medicine than the label tells you to. If your child does not get better, talk to your doctor. Do not give to babies less than 2 months of old. Only give if your baby weighs over 4 kg and was born after 37 weeks. Do not give more than 2 doses. This is to ensure that fever that may be due to a serious infection is quickly diagnosed. If your child is still feverish after two doses, talk to your doctor or pharmacist. CONTAINS PARACETAMOL Do not give anything else containing paracetamol while giving this medicine. Talk to a doctor at once if your child takes too much of this medicine, even if they seem well. 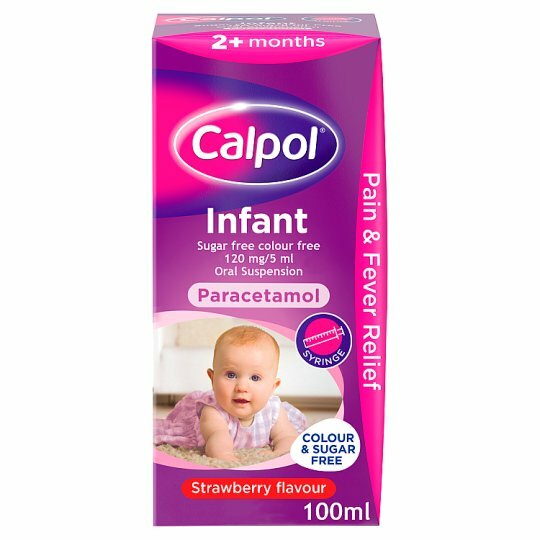 As with all medicines, if your child is currently taking any other medicine consult your doctor or pharmacist before using this product. Please see leaflet. Keep out of the sight and reach of children. Check that the cap on the bottle is securely engaged at all times.